In a small bowl, whisk milk & flour until smooth. Place in a sauce pan and bring to a boil. Reduce heat. Cook and stir over low heat until thickened, about 2 minutes. Serve over fettuccini or your favorite pasta. 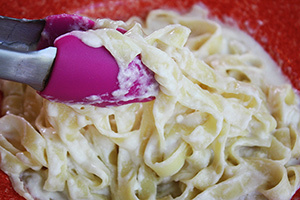 32 Comments on "5-Minute Fettuccini Alfredo"
thank you so much that five minute easy recipe was so delicious can you please hit me up every week with new updates. I only post a few recipes a year. Thank you so much the easy recipe was delicious I don’t know what I would of done without that recipe. Is there anywhere to get nutrition information with your delicious recipes? On a fluke you showed up on a youtube search… I made my friends watch every episode…. Can you use Whole Milk in all of your recipes that require milk? Also I just found your blog and so far I love it. Fail! Was way too liquid, never thickened! I made this with pasta and your lemon-breaded chicken cutlets, plus steamed broccoli, nice sides. Chicken was great Thanks. But Alfredo not great! No changes no substitutions, let me know any advice? Thanks and much appreciation. I wish I could help. If you didn’t use fat free milk, I don’t know why it would be too liquid. May I ask what milk you did use? Alfredo sauce is one of my two tests for any Italian restaurant and it’s been twenty years and two states ago since I last had an Alfredo perfetto. This recipe won’t completely assuage that desire because, well, cream, but I also know, just by reading it, that I’ll love it, and it’s so much better for us than my dear old fave. Thank you for sharing! Can you substitute 2% in this as well as most of your recipes for 1% milk? I only post my recipes as I make them so you would have to try. It seems that 1 or 2% are pretty close but I can’t say for sure unless I’ve done it myself. I’ve made it with 2%….it’s delicious! Hi jenny. Love your recipes, and you. Could you please put the nutrition with your recipes? I know they are a healthier version but, my husband is a diabetic and I would love to cook everything you make. I could eat it all. Keep them coming. You are terrific. I use Almond milk in all my cream recipes, it actually becomes a lot more creamy then milk. My husband asked for it every time i make mac and cheese. He loves it. Gracias por tus recetas, son maravillosas !!! y fáciles. Saludos desde Argentina! I never let my husband order this in a restaurant (poor guy) because of the fat content. I guess I’ll be making this for him very soon. He always says that he likes my “restaurant” better anyway. 1. No foo-foo fussy stuff! I like to keep it simple! 2. Easy on damaged, or for some of us ‘older’ cooks, wrists! I can make bread again. Thanks! Could I ask for a consideration? Please, beside your archived stuff (February 2012, example) put one or two short words to tell what I might find there? I don´t want to plow through this whole (rather daunting!) list of archived material to find, for instance, something on sweet potatoes! Thanks for considering.. Besides the recipe search box, there is also a blog search box that should be helpful in finding things. I stumbled across your recipes on YouTube and have been browsing your videos and recipes. I am so impressed that everything is so simple! You don’t use a ton of fussy extra ingredients to make things fancy. I’m excited to start trying your recipes. Thanks for sharing your expertise. I have traditionally bought Alfredo sauce , But since making your version I will Never go back. It was delicious . Thanks Jenny. I have a question about heating up cheese..
Won’t they turn grainy if you put them on heat? I thought usually the cheese is added after we turn off the heat..? thanks! That does not apply to grated Parmesan cheese. Do you grate your own cheese, or do you use some from a canister? I buy my parmesan cheese already grated from the deli section of the store, where they grate it fresh, not the packed kind. Can I use whole milk in some of your recipes that require milk?